Discussion in 'Acer' started by ThatOldGuy, Jun 3, 2018. Thought this should have its own thread because it is the second AMD only gaming machine in recent years. "Jumping into the Predator Helios 500 (PH517-61) laptop, it’s a full-on AMD model of their Helios lineup, featuring an AMD Ryzen 7 2700 processor (2nd gen Ryzan) which is paired with an AMD RX Vega 56 GPU with 8 GB of HBM2. This 17.3-inch laptop offers the customer a choice of either a 1920x1080 144 Hz display, or a 3840x2160 60 Hz IPS display, both of which support FreeSync variable refresh rate. Acer is cooling the laptop with AeroBlade 3D metal fans, and five internal heat pipes to transfer the heat over to those fans. The laptop features a 2.1 speaker setup and Acer TrueHarmony and Waves MaxxAudio, along with Waves Nx head-tracking technology which allows for spatial tracking of your headphones for more realistic 3D audio. We don’t have full specifications yet, but expect it to be similar to the Coffee Lake powered model already launched. Starting price for the Helios 500 AMD model is $2199, with shipments starting in July." Do we think there is a possibility that the RX Vega 56 could be a MXM format? Sean P., Dennismungai, Vistar Shook and 5 others like this. Honestly I highly doubt it's an MXM notebook, hoewver the cooling(at least on the picture), looks really promising. I would love to get some benchmarks from that machine. hmscott, raz8020, ThatOldGuy and 1 other person like this. 99% sure its not going to be MXM. The fact that it has HBM2 means it will not have the usual VRAM configuration that you find on MXM cards. It might technically be possible to make an MXM Vega 56, but I highly doubt AMD would put the effort into it. MXM is still seen as a "niche" market. Its a miracle we are still getting nVidia cards on MXM, even if they change the form factor every generation. Dennismungai, Grant B Gibson, hmscott and 3 others like this. Vistar Shook, Ashtrix, raz8020 and 2 others like this. Bravo Acer, Bravo, I tip my hat, The Acer Helios 500 Is an absolute success. This is the first time I've seen a notebook that makes the GPU and CPU run under furrmark + Prime95 GPU (stock thermal paste): 62 (GTX 1070) and CPU 81C (8750H). This will be the new notebook I will recommend for people, the performance and cooling is superb, it beats everything. The sound is amazing, the emission is low noise, this is a masterpiece. jclausius, Dennismungai and hmscott like this. Can we get a 15” version? I’m in for one of those if it’s not too hideous. 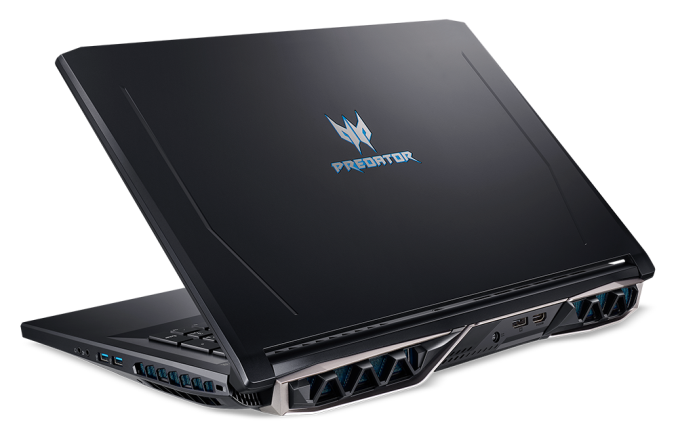 The Predator Helios 500 will as well be equipped with a 6C/12T Intel i9-8950HK. The graphics card is an Nvidia GTX 1070 which is a bit of a let down considering it is paired with the most powerful mobile CPU. But the GTX 1070 is still a very capable GPU and all but the most discerning high-frame-rate gamers will be happy. We suspect the GTX 1070 was used to reduce the load on the cooling system. Acer says they support overclocking of both the CPU and GPU. Ashtrix, Vistar Shook and hmscott like this. "Hot Surface Warning Do Not Touch"
Dennismungai and hmscott like this.